Chromatography allows you to take a closer look at the glorious colors of autumn leaves. Autumn leaves change colors because chlorophyll levels are reduced. These levels change because of plant hormones, called auxins, that prepare leaves to fall before snow or heavy rains in winter. This period of preparation is called senescence. The act of dropping leaves is called abscission. Through most of the growing season, leaves are one shade of green or another. The green pigment we see is the chlorophyll used in photosynthesis. There are actually several other colors present, we just can’t see them. Chromatography gives you an inside view into those colors. High-tech chromatography (and some crazy math) are used to rank the heat of chili peppers. The American Spice Trade Association (ASTA) measures the pungency of different samples with Scoville heat units (SHUs), as a function of capsaicin levels. While there is plenty of science to support the importance of installing plants where they will thrive, the concept of plants ‘liking’ and ‘helping’ one another is actually a failed attempt at simplifying complex processes. Back in the 1930’s, Dr. Ehrenfried Pfeiffer conducted a study he called the “sensitive crystallization method” using chromatography. Somehow, the good doctor decided that matching colors implied compatibility, which it doesn’t. But the process is very fascinating, nonetheless, so let’s get started! Sort your leaves by color. Tear the leaves into tiny pieces. Crush the leaf bits, using the mortar and pestle (or the back of a spoon). Place the crushed leaf bits into their labelled jars. Cut the coffee filters or paper towels into strips that are longer than the depth of your jars. Insert the paper strips into the jars, with the ends draping over, or taping the top edge. Pour enough rubbing alcohol into each jar to cover the mashed leaves. Wait and watch the magic! You can speed up this process by setting the jars in a Pyrex baking pan and pouring boiling water around (not in) the jars. Check out my pages on deciduous, abscission, and senescence to see what those different colors mean. If you enjoy curry, you may want to try growing your own fenugreek. But don’t do it for the wrong reasons. Fenugreek is one of those foods touted as a miraculous cure-all for cramps, hair loss, high blood sugar, insufficient breast milk, indigestion, and diabetes. While there may be some truth to the diabetes claim, all the other claims lack any scientific proof, and even the diabetes research is incomplete at this time. That being said, there are plenty of delicious reasons to grow your own fenugreek. For over 4,000 years, people have grown this annual legume. It thrives in semiarid conditions, and its seeds and leaves are popular ingredients in dishes from South and Central Asia. Like other legumes, fenugreek is high in protein and fiber. A 3.5 ounce serving of fenugreek seed provides 323 calories, 58g. carbohydrates, 25g. dietary fiber, and 23g. of protein. It also contains significant portions of the RDAs for thiamine (28%), riboflavin (31%), Vitamin B6, (46%), folate (14%), iron (262%), magnesium (54%), manganese (59%), phosphorus (42%), and zinc (26%). [Who knew curry was so good for us?!!?] Fenugreek seeds are generally roasted to reduce bitterness and enrich flavor. And it’s not just the seeds of the fenugreek plant that are eaten. Fresh fenugreek leaves, which are said to taste similar to spinach, are used as a vegetable in many Persian and Indian dishes. Dried leaves are used as an herb. Fenugreek (Trigonella foenum-graecum), also known as methi, samurai, and hilba, among others, is a fragrant annual. It may grow as a single stem, or as a small bushy plant, reaching a height of 2 feet. Green to purple oval leaves are small and trifoliate (having three leaflets). It looks a lot like clover and alfalfa. Flowers are small and either white or purple. Seeds develop inside curved yellow pods. This plant is moderately drought resistant and it can handle a light frost. This plant needs heat, so you may want to grow it in a container, maybe on a windowsill. Fenugreek has a shallow root system, so the container does not need to be very large. You can grow fenugreek as a microgreen by simply sprinkling seeds on top the soil in a shallow container, and then lightly covering them with more soil. Fenugreek seeds should be planted 1/4” deep, in rich potting soil. Keep the soil moist until germination occurs. Fenugreek does not like our heavy clay, and it does not take kindly to being transplanted, so it is best started where it will stay for the growing season. 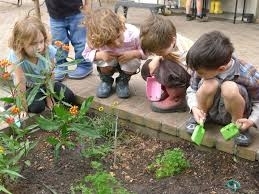 These seeds sprout very quickly, usually in only 2 to 4 days, making it an exciting children’s activity. Fenugreek is susceptible to root rot, powdery mildew, and charcoal rot. These diseases can be minimized by allowing the soil to dry out between waterings. Aphids are the most common pest of fenugreek. Fenugreek can be grown as a microgreen, or you can go for the full growing experience. Generally, young leaves and shoots are snipped off the plant early in the growing season. Then the plant is allowed to continue growing to produce seeds, usually 3 to 5 months after planting. To harvest seeds, the plant is removed and hung upside down to dry. Have you had your fenugreek today?